In high school, I was one of the few people who carried a pencil pouch with my school supplies. In college, my pencil pouch was absolutely essential to my existence. Now that I've graduated, my pencil pouch remains a feature in my day to day life and travels to work with me in my purse each day. 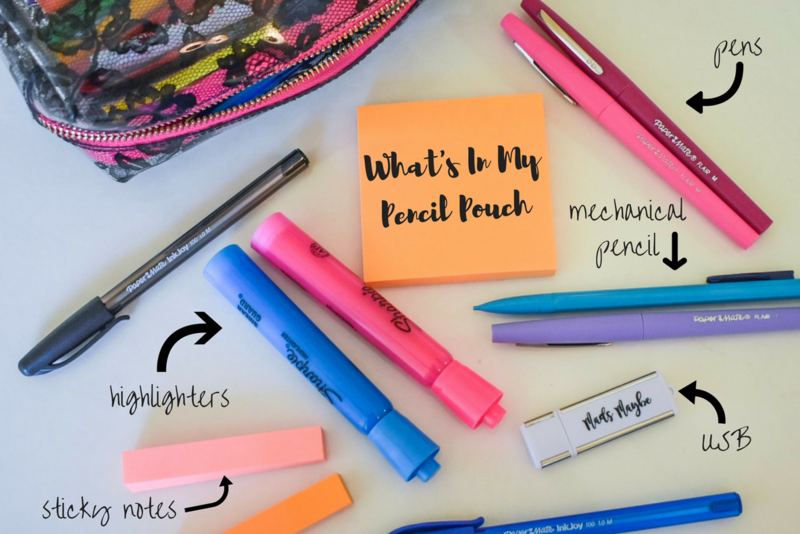 Having a pencil pouch is an absolute necessity no matter what you're doing - seriously, how else would you keep up with all of your pens for color-coding your planner?? While some items in my pencil pouch may have changed over the years (did anyone else use a clicker in college? ), most of the items have stayed tried and true. These staples have maintained a spot in my prized pouch that has transferred from backpack to tote to purse, ranging from must-haves to just in case items that I always have on hand. Let's start with discussing the pouch itself. My pencil pouch in middle school was the typical zip pouch you'd find on the back to school aisle that fit perfectly into your three-ring binder. It wasn't until college that I found out that the perfect, ideal case isn't actually sold as a pencil pouch at all. I started using small zip pouches that might typically be used for holding jewelry or makeup. My favorites are made with transparent material so that I can easily see the color of the pen I'm reaching for and the pouch's length should be slightly longer than a pencil. My preferred writing utensil is a pen so I keep plenty on hand. Black pens are always essential and I also keep a set of colored pens which I use in my planner. Paper Mate makes my absolute favorite colored pens — they're long lasting and I know their felt tip pens don't bleed through my planner pages (this isn't the case with notebook paper) so I love using them. I keep both a set of felt tip colored pens and a set of ballpoint colored pens in my pencil pouch because they're very useful and each have their own purposes. I know we have various options for storing files now, but a USB is a staple that you'll always want to have — particularly in college. There are many different programs that save files in formats that can't easily be transmitted over the Internet, making a USB your absolute lifesaver in a college computer lab. If you're working on multiple computers, your USB can easily and seamlessly transition your project, regardless of your Internet connection. Don't forget, it never hurts to save your documents in multiple locations: your computer hard drive, a USB, the cloud, an external hard drive. How cute is my Mads Maybe USB from USB Memory Direct, by the way? Note: My USB drive was a gift from USB Memory Direct, however, all thoughts and opinions expressed are my own. Sticky notes are the most convenient, smallest forms of paper. If you happen to have no other paper with you, you'll always have a sticky note in your pencil pouch to write on. 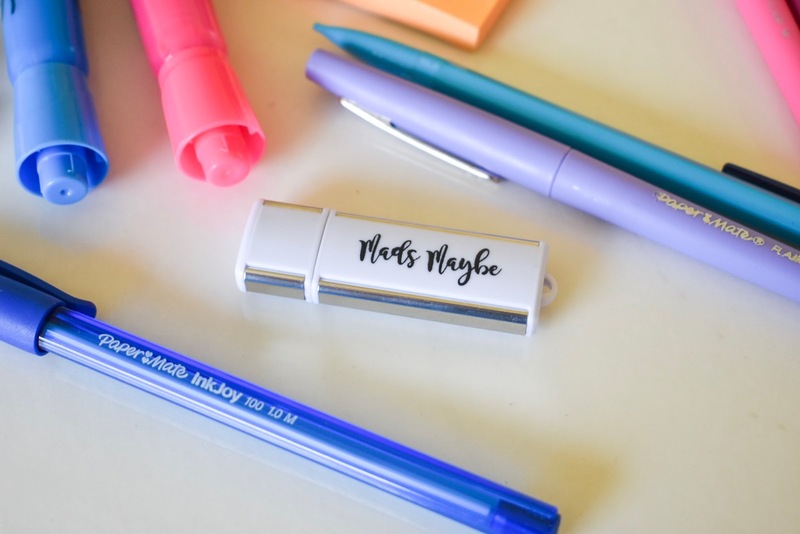 They're useful for leaving a note attached to a document, making lists, and adding tentative notes to your planner that you aren't quite ready to make permanent yet. I also have a new love for these tiny page-marker sticky notes. I'm not the type of person who can write in a textbook so I found that these sticky notes were great for marking places with a small note on their significance. Pencils have slowly faded out of my life — they were necessary in college for Scantron tests so I always had a few at the ready. Now, I always keep one pencil in my pencil pouch in case I want to sketch something before making it permanent. I never used mechanical pencils in school, but since I started college, I've never kept a traditional pencil in my pencil pouch. Mechanical pencils are an absolute must because you can retract the lead. Otherwise, the lead would become very messy, leaving marks and messes in your pencil pouch over time. Highlighters are more of a just-in-case item in my life now, but I always have at least two different colors available so that I can use color to distinguish markings. They're perfect for editing documents and taking notes while reading. If you're using highlighters while editing a document, you could use your yellow one to mark misspelled words and grammatical errors, while using your pink one to signify text that requires clarification or more detail. It's very useful to have multiple options so that you're able to create that code. 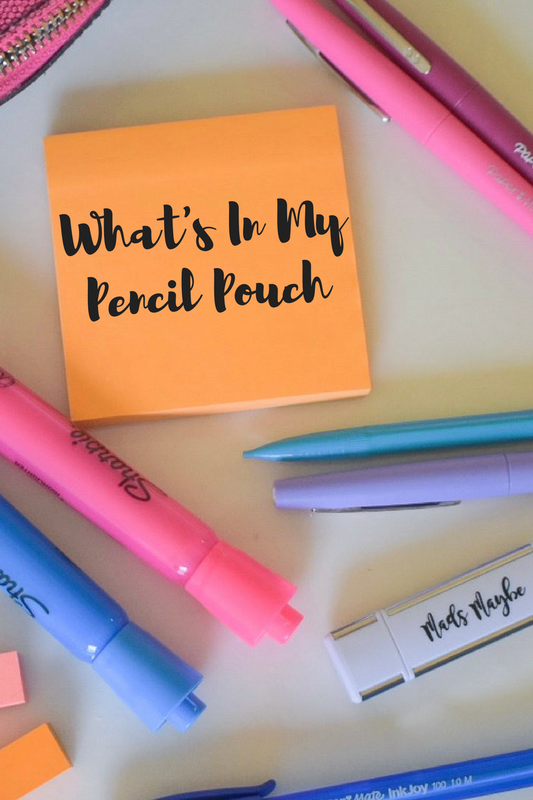 What are your pencil pouch must-haves?